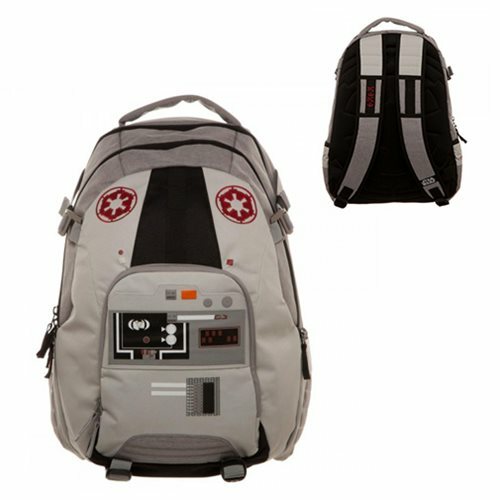 Rep the Empire with this backpack! It features 3 large main pockets and 2 expandable side pockets! Hold a 15-inch laptop and measures 18 1/2-inches tall x 12-inches wide. Inspired by the uniform of AT-AT drivers. Rep the Empire with this backpack inspired by the uniform of its AT-AT drivers! The Star Wars AT-AT Pilot Backpack features 3 large main pockets and 2 side pockets, and it can hold up to a 15-inch laptop. Made of polyester, it measures approximately 18 1/2-inches tall x 12-inches wide x 9-inches long.